For stage workers, this prop allows you to change a cane into an umbrella (and let's be honest, haven't we all wanted to do this as we're walking home and it starts to rain). This is a colorful stage effect which is easy to do and can be performed surrounded by spectators. A cane stands on a pedestal with a silk hanky tied at the top. When the magician gives a tug to the hanky, the cane disappears and, in its place, appears two open, upside-down umbrellas stacked on top of each other. 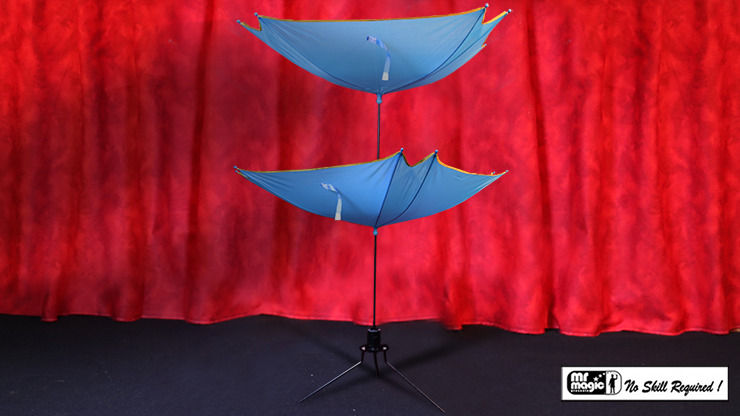 The umbrellas can be used to drop light props into them as the performer continues doing effects. Set-up is easy. Written instructions included.